How Harry A. Knox became to be an automobile manufacturer probably has something to do with how this car looks. His neighbor happened to be J. Frank Duryea, who along with his brother, was one of America’s first automobile producers. And their early cars looked a lot like this (three-wheelers included). 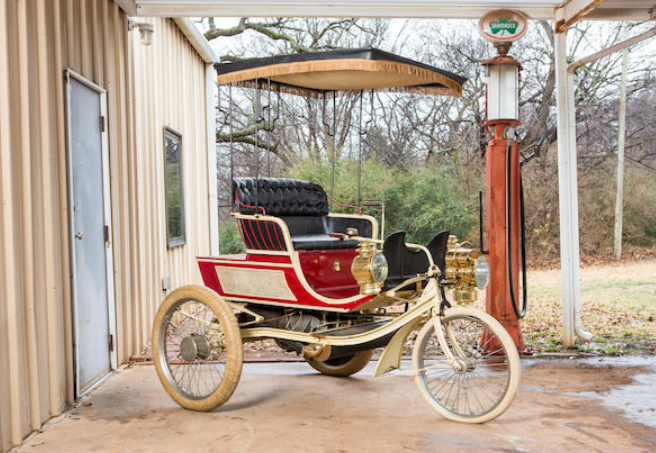 The auction catalog lists this as a c.1899, but my information says that Knox built their first 15 3-wheelers in 1900. Another 100 were built in 1901, and a 4-wheeler was added in 1902. This car is powered by a five horsepower, 1.6-liter single-cylinder engine. The engine number is 28, which might mean this was actually built in 1901. In any case, it’s one of the earliest Knox cars around, and it is really, really cool. It should sell for between $100,000-$120,000. Click here for more info and here for more from this sale. Here’s a later Knox, and a much larger, more traditional example. When I think of this marque I think of tiny, early runabouts like this one. But later on, they certainly built big tourers as well. 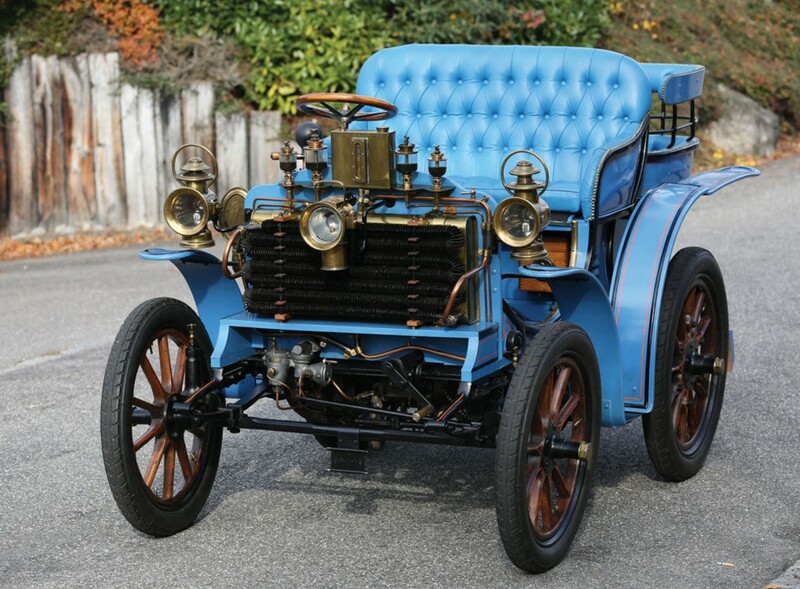 The Model R was sold in 1910 through 1912 and it is powered by a 40 horsepower, 6.1-liter straight-four. It has shaft drive and is finished in an attractive combo of blue with red wheels. The restoration is described as older, but with big power on tap, it should be a nice, usable car. 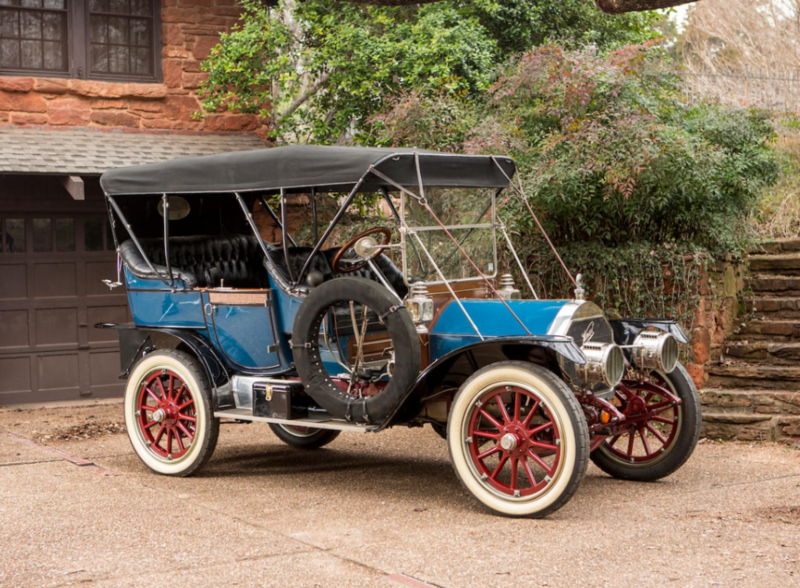 The seven-passenger touring body style was only available on the Model R in 1912, after the wheelbase was extended to 122″. But who knows, anything is possible with old cars. This one should bring between $175,000-$250,000. Click here for more info and here for more from Bonhams. 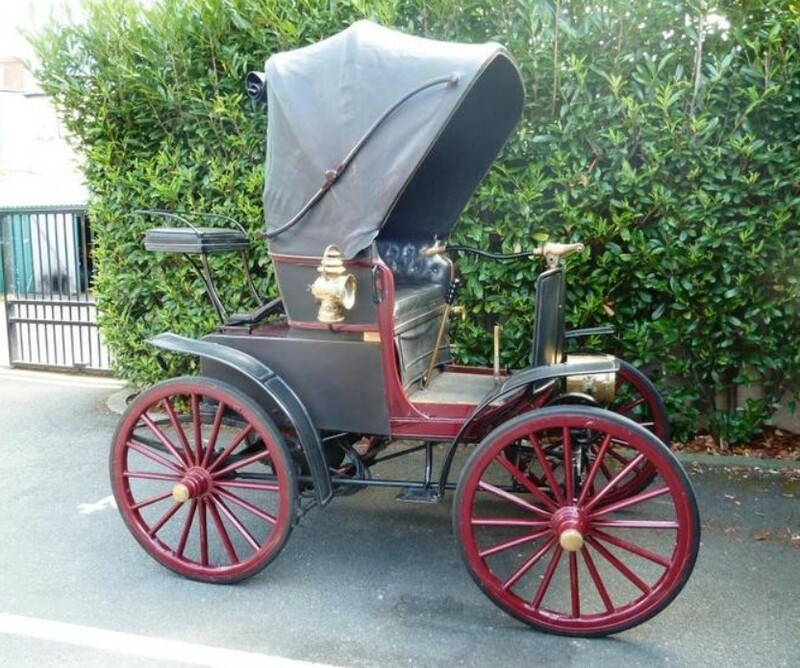 There have been so many great pre-1905 cars for sale lately! This car is from the mini-empire of marques featuring Adolphe Clément’s name. 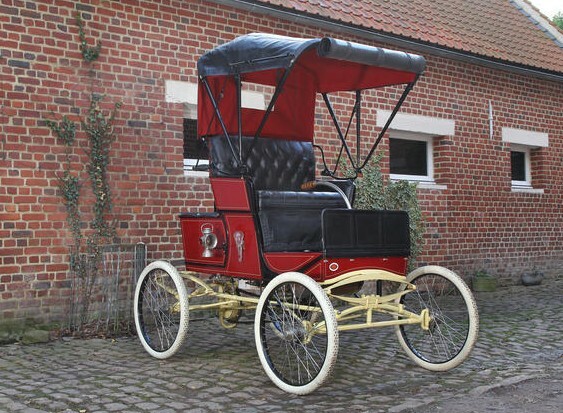 Clement was on the board at Panhard et Levassor and when the company’s factory was found to not be adequate enough to build a run of a 4.5hp “dog carts” that were designed by Arthur Krebs, Clement set up his own concern to build them. Clement-Panhards were available between 1898 and about 1900. They featured a rear-mounted single-cylinder engine that made 4.5 horsepower and drove the rear wheels through an exposed-gear transmission. The three headlights and center-pivot steering give it an unusual face that only its mother could love. In the U.K., these were called Clement-Stirlings or Stirling-Panhards. Only about 500 were built and body styles differed wildly from chassis to chassis. This car has two bench seats that face each other, which was a weird fad among early cars. This one hasn’t been used in a while but it was well kept for the last many decades. It should sell for between $40,000-$50,000. Click here for more info and here for more from this sale. Cars built in 1899 and 1900 were identical except for the badging. 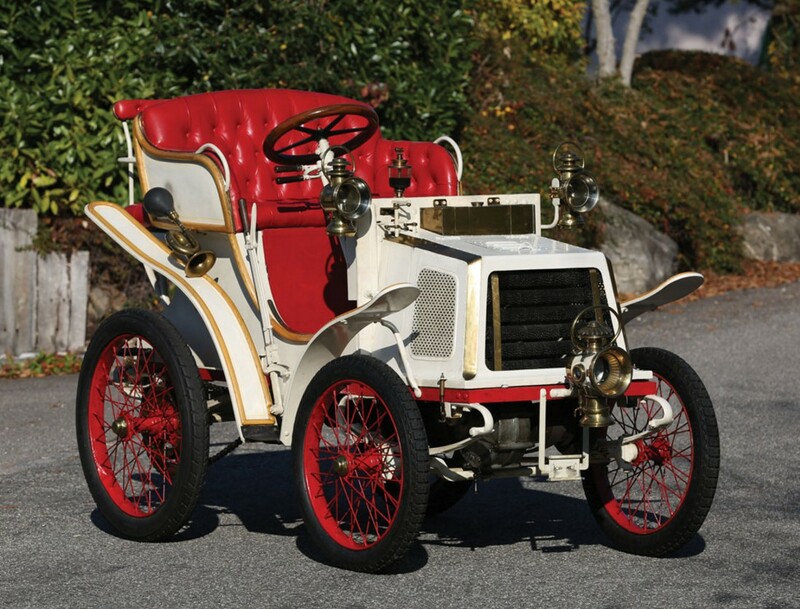 The final cars were built in 1902 (which included a 35 horsepower six-cylinder car shown at the New York Auto Show). That six-cylinder car was a long way from this three horsepower, single-cylinder Runabout built only two years earlier. This chassis was discovered in a warehouse in the 1950s and restored. No word on if the current restoration dates to the 1950s or not, but it looks quite nice, if a little dated. It’s something you could use (lightly) and show – and draw a crowd wherever you go. The Gasmobile was considered one of America’s finest early cars but the company folded anyway (Flagler moved on to the short-lived Panam car). This is one of only a few survivors and you can check out more about it here. Click here for more from this sale. The corporate history of the Mobile Company of America is very confusing. It was founded in Tarrytown, New York, by John B. Walker. Originally, Walker and his business partner (who, together, had bought the rights to the Stanley brothers’ first steam car design) were going to call the car something else. But they ended up fighting over it and Walker ended up with the Stanley rights. The Mobile was born. Mobile only sold cars between 1900 and 1903. Most looked something like this Model 4 “Solid Seat Runabout” that originally retailed for $750 – among the cheapest cars the company offered. This car is powered by 5.5 horsepower two-cylinder steam engine. Only about 600 Mobile Steam cars were built and it is thought that only about 10-12 survive. This one has been well-restored and does run and drive. It should bring between $40,000-$50,000. Click here for more info and here for more from this sale. Louis Bardon founded his automobile company in 1899 in Puteaux, France. The company produced cars up through 1903 when Georges Richard took over the plant and used it to manufacture Unic cars. Bardon built a number of different cars over the short lifespan of the company. This car is powered a 4/5 horsepower 1.2-liter opposed-piston single-cylinder engine. That means that there are two pistons that share the same cylinder. It’s a really strange and interesting powerplant. Only three Bardon cars are known to exist and the other two are in long-term collections, unlikely to come up for sale in the near future, if ever. The restoration on this car was completed a while back but is still a good runner, driver, and shower. Click here for more info and here for more from this sale. Créanche was a French automobile manufacturer that existed in the very early days of automobiles. There were so many manufacturers of that period, many of which built just a handful of cars. Some lasted for a few years, like this one, which operated from 1899 through 1906. 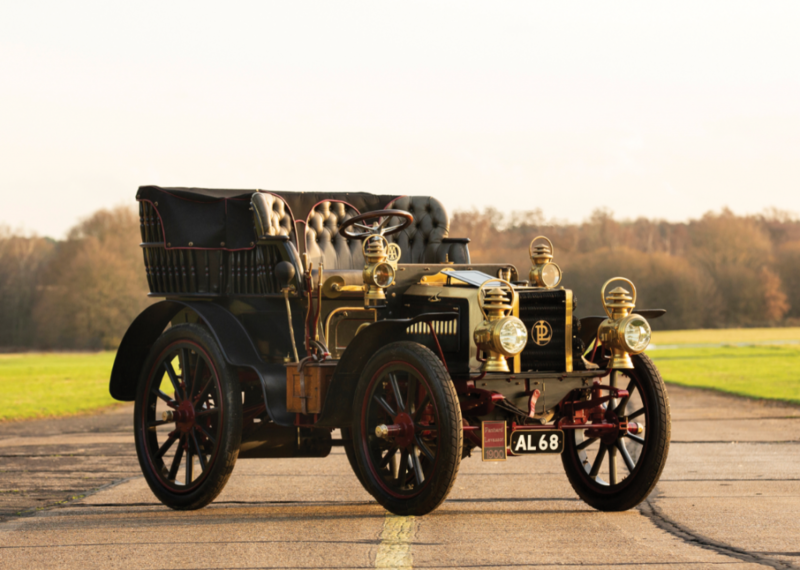 Most of their cars were De Dion-powered and by 1904 the company offered five different models. This one is powered by a four horsepower, 477cc single-cylinder engine. This example was restored from an original car and the body was reconstructed to match the original in 1972. This is one of two known survivors of the Créanche brand. It comes from a private Swiss collection (as do three other very interesting cars from this sale). Click here for more info and here for more from this sale. They are powered by a 3.5 horsepower electric motor and could be had in one of eight body styles. This is a three-seat stanhope. 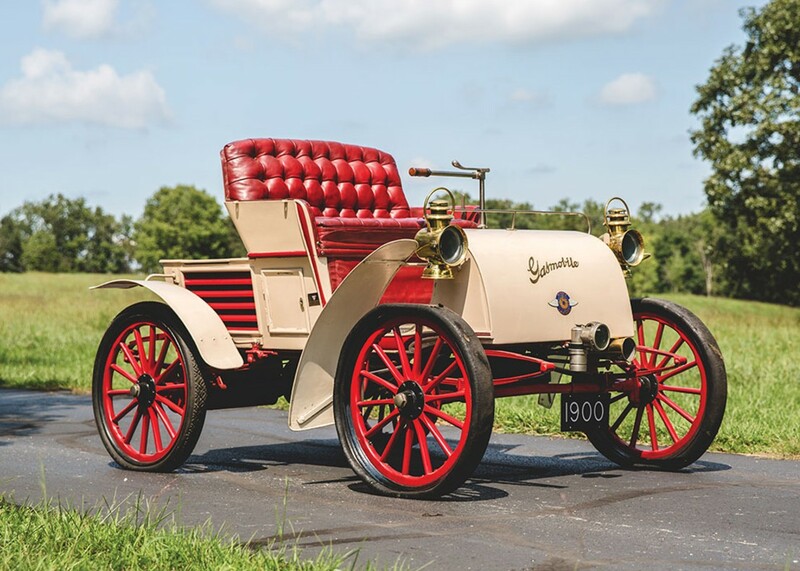 Sperry sold their patents to the Cleveland Machine Screw Company in 1901 and they produced the car under the Cleveland marque from 1902 through 1904. Part of Sperry’s electric engineering company still exists today as part of Honeywell. This car is one of two Sperrys known to exist. It has known history for the last 25 years and has been run in many rallies and shown at many shows around the U.K. It should sell for between $77,000-$83,000. Click here for more info and here for more from this sale. The Alfa Romeo 1900M was known widely as the Alfa Romeo Matta. It was produced for the Italian Army for a short period in the 1950s. They also produced a limited run of “AR52” models that were intended for civilian use – but those are much rarer. 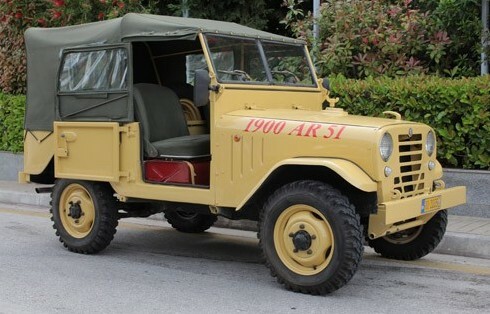 It was essentially an Italian Willys Jeep – but a little more complex (which is why Alfa switched to the easier-to-repair Campagnola after only a few years). The engine here is a 1.9-liter straight-four making 64 horsepower. All four wheels are driven and it could do 65 mph. The Matta was produced between 1952 and 1954 only. Only 2,007 AR51 variants were built. This is a very rare automobile and a well-restored, matching-numbers example at that. It should sell for between $19,000-$21,500. Click here for more info and here for more from Coys in Greece. 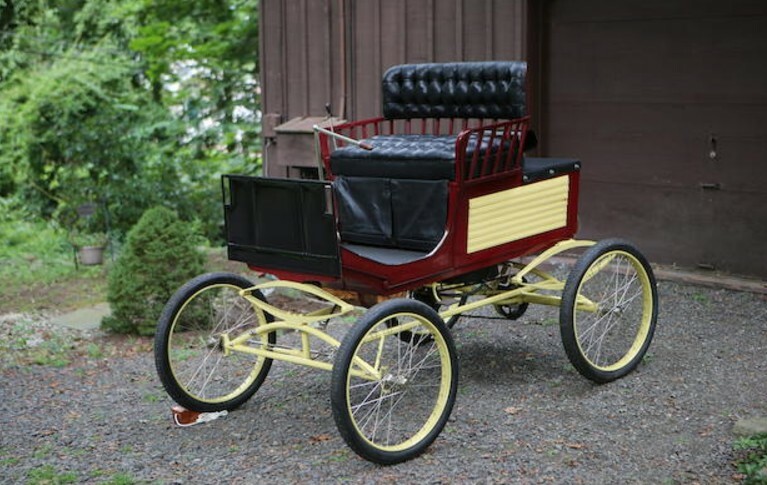 The Marlboro Motor & Carriage Company began producing steam cars in Marlboro, Massachusetts in 1899. The company was founded by Orrin P. Walker and existed only through 1902. The engine is a Mason steam engine and this car cost $700 when new. About 30 were sold in 1900 and production ramped up. But then sales quickly dropped off and the company had all of its capital invested in product that was sitting in showrooms. And that was it for the short-lived company – out of business it went. It’s amazing that any of their cars survived for 114 years. This one was restored and the current owner acquired it in 2011. It was for sale in St. Louis for $79,500 but is expected to sell at this auction for between $68,000-$96,000. Click here for more info and here for more from this sale. Update II: Sold, RM Sotheby’s London 2017, $12,146.